MANILA, Philippines — The more than one million government personnel, from President Duterte down to the lowest-paid worker, are expected to get their salary increase for three months today. In her circular, Abuel reiterated the mandate under Executive Order 76 for government agencies to use “any available appropriations under the 2018 General Appropriations Act, as reenacted” for the increase. On March 15, the President signed EO 76, which serves as the enabling legal authority for the pay hike. It amended EO 201, issued by then president Benigno Aquino III in February 2016, which contains the latest four-year salary adjustment program for the bureaucracy that ends this year. Aquino’s issuance provides that funds for the program are to be included in the annual national budget. This prompted Duterte to issue EO 76 due to delays in the enactment of the spending bill for this year. Abuel’s circular informed agency heads that the salary increase retroacted to Jan. 1. Duterte is expected to receive a total of about P300,000. Under Aquino’s EO 201, his monthly salary jumped by nearly P102,000, from P298,083 to P399,739. Duterte has often complained his compensation was not enough for his two families. Aquino did not benefit from his issuance. His monthly salary was P120,000, only a third of what his successor is receiving. In contrast to Duterte’s pay hike, the lowest-paid government worker is getting a P1,000 salary increase, from P10,050 to P11,068. He receives a maximum of P11,732 depending on his length of service. Vice President Leni Robredo, Senate President Vicente Sotto III, Speaker Gloria Macapagal Arroyo and Chief Justice Lucas Bersamin enjoy a maximum salary this year of P353,470, up by more than P88,000 from last year’s P264,721. 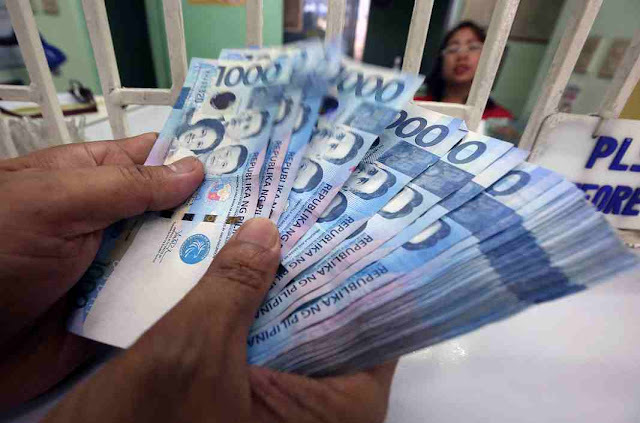 Cabinet members, other officials with Cabinet rank, senators and congressmen will receive a pay hike of nearly P72,000, from P223,590 to P295,191. The adjusted compensation for teachers and nurses ranges from P20,754, which is the entry pay, to P22,829. They received from P20,179 to P22,055 last year. Thus, their increase amounts to P575-P774, less than one percent of Duterte’s P102,000. Party-list group Ang Nars has a petition pending with the Supreme Court to compel the government to comply with the Philippine Nursing Act of 2002, which sets the pay level for nurses at Salary Grade 15 and pays between P30,531 and P33,279 depending on length of service. However, the government is opposing the petition. Salary Grade 15 is also the entry-level pay public school teachers are demanding. Former budget secretary and now Bangko Sentral ng Pilipinas Governor Benjamin Diokno had refused to release funds for the adjustment, saying he would violate the law and the Constitution if he did so. Diokno said funds for the increase are contained in the still-to-be-enacted 2019 national budget.